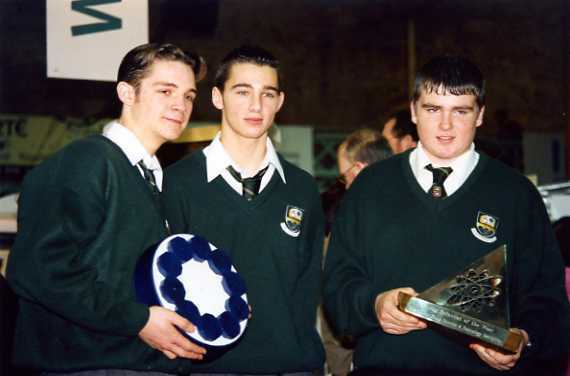 One of the pinnacles of the school's history came in 2000, when two of our students, Peter Taylor and Shane Browne, under the supervision of their Maths teacher Dr Patrick Quill, won the Group prize and the Intel Excellence Award at the BT Young Scientist and Technology Exhibition. Their project entitled "An Investigation into Pascal's Triangle" explored an ancient triangular array of numbers named after the french Mathematician and philosopher Blaise Pascal. They then put in a very creditable performance in the International Science and Engineering Fair in Detroit, coming fourth in Maths and winning the Society for Technical Communication Award. The following year, an enlarged team of Peter Taylor, Shane Browne and Michael O'Toole, again under the guidance of Dr Patrick Quill, won the BT Young Scientist and Technology Exhibition outright with their geometrical project "Investigating symmetrical shapes formed by polygons". They went on to take third prize in the European Union Science Fair in Bergen, Norway in January 2002. St Kilian's CS students continue to regularly take part in the Young Scientist Exhibition.